When and how did you first become interested in kites? 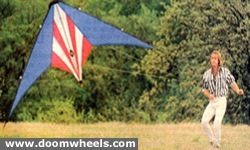 "In 1985 a friend of mine bought a 10' Flexifoil Powerkite and was thrilled by its power. He twisted my arm until I broke down and bought my first kite, a 6' Flexifoil. I immediately caught the bug! I learned to fly at night in a field by the mall, taking to it right away. Soon after, I started collecting a train of 4' diamond stunters with 100' tube tails (15 in total) flying them at the high school field along the freeway for hours every weekend. People still talk about the guy with all the kites and tails that used to fly at the school." When did you decide to design your own kites? "In 1989 I was competing and doing well at local events, but poorly against the more experienced flyers. The kites that were out at the time were too slow and limiting for the kind of routines that I was hoping to create, so I started thinking of a design that would best suit my personal style. I bought a sewing machine and used it to design the prototype kites that later became the Wizard. After several weeks of work, that radical 6ft kite became perfectly suited for the style of flight I had envisioned." Did you ever think kites would turn into a full time job? "At first I was only making kites for myself and a few friends. I wasn't interested in marketing them, but the Wizard's growing popularity made it difficult to avoid. I hooked up with some premier stores, and in no time the orders became hard to satisfy. I had to hire help and find a shop. At the trade shows, we would have lines of vendors placing orders, purchasing armfuls of kites right from the showroom floor. I was working everyday from morning until late at night, yet could never catch up with the demand. This went on for two years before the company grew big enough to handle the work load. It's A Breeze Kites lives on today as a repected sport kite design company"
Did you ever have unusual or funny experiences while flying kites? "Once at a city celebration in a Dallas park, I was doing a demo fly over a small lake. I was flying a train of three diamonds with long tails slapping them quickly against the water and relaunching. There were several paddle boats on the lake and I was slapping the water near each of the boats. During one slap, the kites sank into the water too deep and started flying downward beneath the surface. I was familiar with flying kites underwater, a trick we had learned while flying at the local lake fronts, but never with 100' tubular tails (and usually single kites - not trains). I pulled the whole train of kites underwater 'flying' them in a straight line beneath one of the paddle boats, and then surfaced on the other side launching back into the air. It all came off perfectly except that the tails were sealed at the ends and now were filled with water. As the kites flew away, the end of the tails remained stuck to the water. I continued to fly but never higher from the water than the length of the tails. The crowd loved it. I kept flying for a while and then I landed the train so we could empty out the water." What do you do for entertainment on a calm day? "Fly anyway! We make our own wind. Of course these days we fly indoors, don't we!" How does one fly indoors and when did that begin? "We use very lightweight kites that require only your body's movement to create enough wind. My friend David Brittain started flying 4 line kites indoors and set the original timed indoor record. 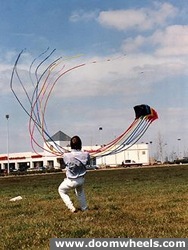 Later, Dean Jordan and I flew the 1st dual line kite indoor demo at a Kansas City competition in 1993. That summer the 3 of us together performed an indoor demo at the East Coast Sport Kite Championships in Wildwood, New Jersey. Flying through the crowd, around tables, through doors and across the stage in front of 1500 banquet attendees, this demo sparked peoples interest in indoor flying and within a couple years became a new event at sport kite competitions worldwide." The Wheels of Doom kite skates... what inspired you to design them? 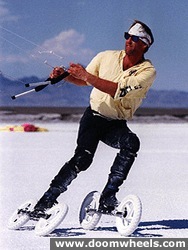 "By the early 1990's we had been kite skating in parking lots on Rollerblades for a couple years. People used to come out to the parking lots to watch us kite skate during festivals. But when kite designer Peter Lynn developed the 3-wheeled kite-powered buggy that could ride on grass and sand, the spectators would stay at the field and watch the buggies. Some people tried to bring skating out to the field with grass skis (a tank treaded skate with ski boots), but I found them too slow and awkward for my taste. I started playing with the idea of off-road, in-line skates that used large air inflated tires. After a few prototypes, I developed the Wheels of Doom as they are in their present state. The Wheels of Doom ride about 5mph faster than buggies due to the fact that you can use a bigger kite and lean harder against its pull to generate more power. I've attained speeds of over 55 mph, and have ridden several thousand miles across beaches and desert dry lake beds in North America and Europe. What aspect of this sport gives you the most satisfaction? "I have always enjoyed the camaraderie of the people in this sport. It is a common occurrence that once competitors finish performing their routines, they would then become the ground crew for a fellow competitor. Although we are sometimes in competition with one another, kite fliers help each other out with best intentions. The people are the best part of kiting." What advice do you have for the novice kitesman? "For the fun flyer... enjoy yourself and involve your friends and family. Keep it light and allow it to fill any empty places in your life. For the competitive flyer... remain true to yourself and find your own style. The popular tricks are good to learn, but don't limit yourself to flying only other people's maneuvers. Be creative, express yourself, remember the basics, and above all else... have fun!"